Home / Stock Picks / Hot Stocks / Will Snap Lose the War With Facebook? Will Snap Lose the War With Facebook? It’s no secret that Facebook Inc (NASDAQ:FB) — which offered to buy Snap Inc (NYSE:SNAP) twice and was twice rejected — has gone to war with Snap. And Facebook has more than enough resources, both in cash, as well as weaponry — its Facebook app, Facebook Messenger, Instagram, WhatsApp. Imitation may be the sincerest form of flattery, but this is little comfort to early SNAP stock holders, who are watching Facebook’s app copy the best features of Snapchat and put them to work with its various tentacles. Because it’s working. Facebook appears to be slowing Snapchat’s growth. That leads to several pivotal questions anyone investing in SNAP have to ask themselves: What’s Snapchat’s competitive advantage now? What other features could be copied? 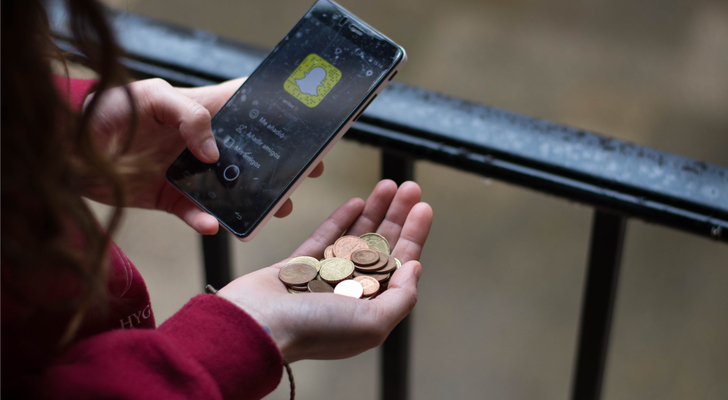 What can Snapchat add to stand out in an increasingly crowded market? The situation favors FB, which has already answered these questions several times over. It looks like Facebook’s, er … “borrowing” of features from Snapchat sped up after 2013, when Snap turned down Facebook’s offer to buy the company. In the years that followed, Facebook copied features from Snapchat such as photo editing, disappearing messages and face-altering filters. Last year, Facebook imitated Snapchat again, buying the face-swapping app Masquerade and adding face-swapping. Facebook also added QR codes for profiles, which Snapchat launched in 2015. Later, Twitter Inc (NYSE:TWTR) copied this feature as well. In February, WhatsApp added its own version of stories to its Status feature, allowing users to share photos and videos for 24 hours. Previously, users could set availability statuses, although WhatsApp relented and brought this back in March. If this weren’t enough, Facebook Messenger added a selfie camera with filters and stickers last year, and in March rolled out Messenger Day, another Snapchat Stories clone. At this point, it’s not a stretch to think Facebook might at some point just make the camera the main interface. We’ll see. But what we do know for now is that FB isn’t shy at all about stealing from SNAP — and worse (for Snapchat), it’s quick and adept at it. How will Snapchat fare against this kind of competition? Well, the simplest way to explain it to people is that SNAP will either be the next Facebook, or the next Twitter. With Snap down roughly 20% since its post-IPO highs, the market in the short-term seems to be leaning toward the latter possibility. Instagram is proving to be a formidable foe, with some reports indicating that it’s slowing Snapchat’s growth by 82%. Also, 65% of 1,600 advertisers polled by RBC Capital Markets and AdAge magazine showed interest in advertising on Instagram, as opposed to only 40% for Snap. Analyst Trip Chowdhry of Global Equities Research is bearish on tech, seeing it as a bubble. Chowdhry hasn’t come out specifically against SNAP — but he has swung against social media in general, including FB. That doesn’t bode well for Snapchat. It’s far from clear how the battle will even play out, let alone end. Maybe Facebook will try to buy Snap again and succeed, as FBN Securities analyst Shebly Seyrafi surmises. Me? I would avoid investing in Snapchat for now. Facebook — which boasts 1.86 billion monthly active users for its main app, 1 billion for Messenger, 1.2 billion for WhatsApp and 600 million for Instagram — is staring down a company with just 300 million MAUs. FB is older, bigger, more established, more diversified and better funded. That doesn’t mean Snap is a lost cause, but it does mean there are safer waters to troll. Article printed from InvestorPlace Media, https://investorplace.com/2017/03/will-snap-inc-lose-the-war-with-facebook-inc-fb/.